This is meant to be a compendium of programming guides for a series of useful Atmel chips. 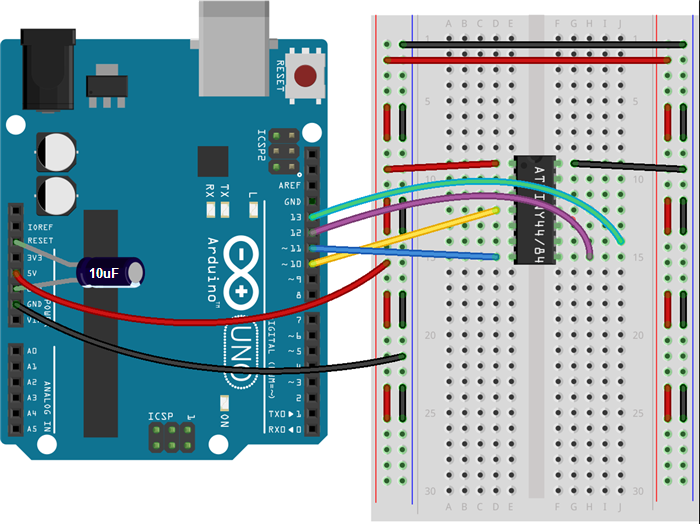 Connect an unwired Arduino to the computer. 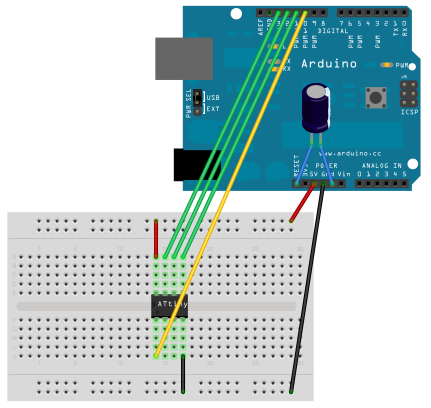 Set Tools/Board to “Arduino/Genuino Uno” and upload the example ArduinoISP sketch. In Documents/Arduino, create a new folder called “hardware”. Wire the devices as shown. 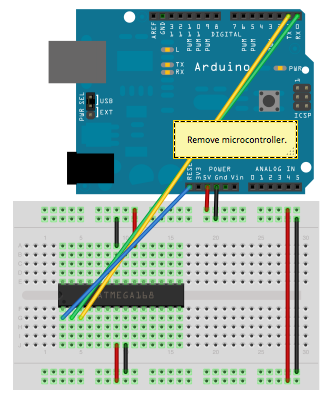 Connect a 10 µF capacitor from reset to ground on the Arduino. 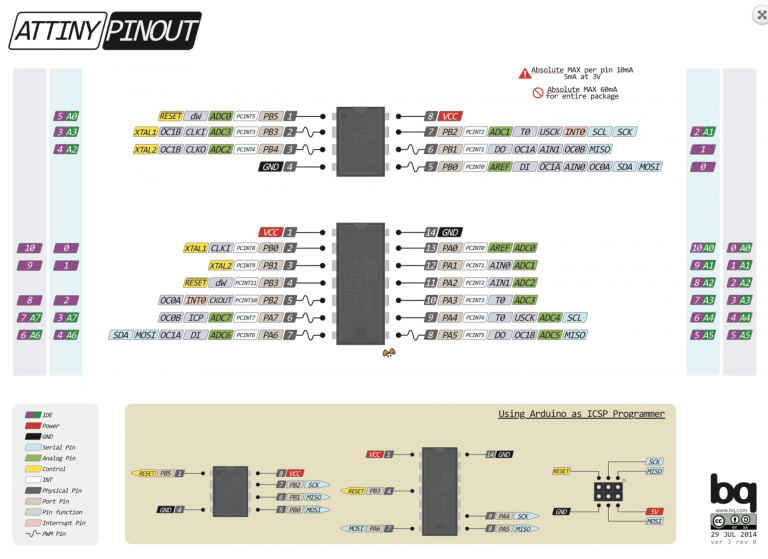 Set Tools/Board to “ATmega328 on a breadboard (8MHz internal)”. Wire the device like shown. Seriously consider buying a regular ATmega328P unless this is all they have at your local electronics store. 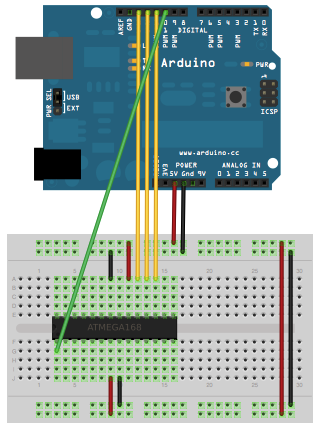 Follow the same instructions as for ATmega328P, but after step 3 edit “boards.txt” within Arduino/hardware/breadboard/avr. 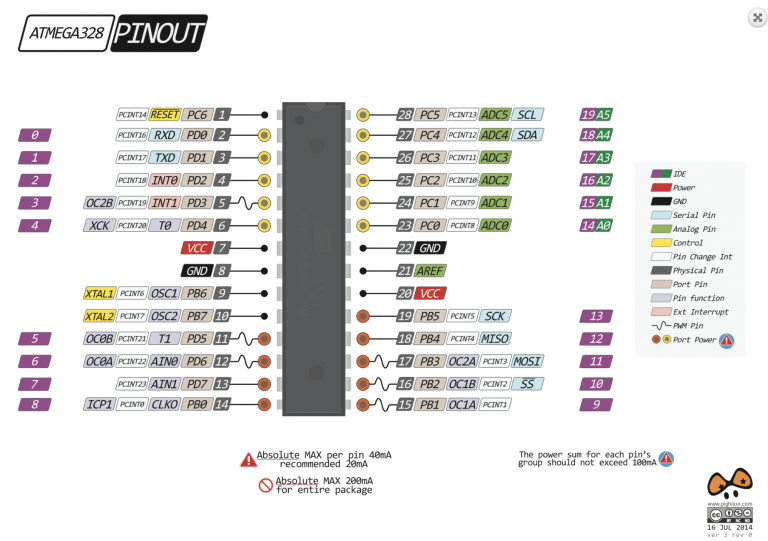 Find the line that reads “atmega328bb.build.mcu=atmega328p” and change atmega328p to atmega328. After step 9, revert this change (the bootloader causes the chip to respond in the same way as a ATmega328P). Open Arduino’s preferences. In Additional Boards Manager URLs, insert https://raw.githubusercontent.com/damellis/attiny/ide-1.6.x-boards-manager/package_damellis_attiny_index.json and press OK.
Go to Tools/Boards/Boards Manager. Search for attiny. Click the first result and press Install. Wire the board as follows. Set Tools/Programmer to Arduino as ISP. For step 7, select ATtiny25/45/85. For step 8, select ATtiny85.